He may not necessarily have been a popular figure - either in his hey days or later. People said he had a huge ego and that he could rarely get along with people. Even with those he seemingly had good relations, he or they eventually fell out. Throughout, in many ways, he was indeed a loner, as though he were leading life as described in one of his famous compositions from the movie, ironically called,Sambandh - Chal akela chal akela chal akela, tera mela peeche choota rahi chal akela. 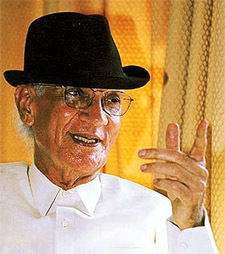 Yet, it cannot be denied that O P Nayyar's contribution to Bollywood music is huge. Even though he had stopped composing for a few years now, in his death, the industry has indeed lost a true maestro. The first time I probably heard about OP Nayyar was in the early eighties when as a kid I watched Kashmir Ki Kali on Doordarshan. From Ishaaron ishaaron mein dil lene wale to Subhanallah (definitely not of Fanaa fame) to Diwana hua badal, the songs from this movie stuck with me for days to come. I would wake up with one of these songs playing in my head, and go to bed with yet another one on my mind. At that age, one didn't necessarily understand who or what a composer was. So, it wasn't surprising that I hadn't heard about OP Nayyar. Worse still, in those early days of burgeoning interest in old Hindi music, old songs meant songs of Lata Mangeshkar, Mohd. Rafi and Mukesh. Asha Bhonsle came to mind only if it was a foot-tapping number. And now with Asha, I associated OP too with the lilting, swinging compositions alone. Around this time, my parents, who had a huge collection of LP Records, bought a new record - Enchanting hour with Asha Bhonsle. And I still remember - on one of those quiet, solitary evenings, I sat in the lawn outside of my house in Visakhapatnam, listening to the songs as this LP played in the background. And suddenly the song from Pran Jaaye Par Vachchan Na Jaaye wafted slowly along with the cool breeze and shook me up - is that truly Asha Bhonsle and a song in her wistful voice? I don't actually remember, but I must have immediately gone in to check the cover of the LP Record, just to make sure. And there it was - Chain se hum ko kabhi by Asha Bhonsle (incidentally, the last movie Asha sang for OP in), composer OP Nayyar. As years passed by, my insular prejudices about singers and composers were often challenged in this manner. And as I learnt more and more about Hindi film music, the diversity I encountered in various composers only enriched my listening pleasure and experience; be it the classical style of Jaidev, the melodic, soothing SD Burman numbers or the orchestration in OP Nayyar's compositions. From the sound of a horse galloping in Maang ke saath tumhara and Haule haule saajna to the folklorish style in Ek pardesi mera dil le gaya or Ude jab jab zulphen teri to the pensive notes in Poochon na hame hum unke liye or the romantic notes in Pyar par bas to nahin hai mera lekin, the repertoire of this irreverent composer is tremendous. Almost all his songs seemed to have been inspired by some western numbers, yet the modernity in his music was in perfect sync with the traditional Indian sounds. His localization is in fact is in top form in most of his numbers, giving them a distinct and identifiable individuality that hasn't been replicated ever since and will never be. OP Nayyar always claimed that he was the only composer of his time not to be trained in any form of classical music. His talent, he said, was a god-given gift. His passion for music and natural ear for rhythm are stuff stories are made of - he is said to have dropped out of college to compose music. Guru Dutt's Aar Paar was his first major success, and Geeta Dutt remained the singer he worked with for a very long time in the beginning. The three continued their association in Mr and Mrs 55 and CID, the songs of which are hummed by the GenNext youngsters even today. And when producers dropped the much sought-after composer of the day, Naushad, in his favour, there was no looking back for OP Nayyar. Kashmir Ki Kali, Tumsa Nahin Dekha, Sone Ki Chidiya, Howrah Bridge and many more - how can one even forget any of them? From Mera naam chin chin choo toAayiye meherbaan to Mohabbat kar lo jee bhar lo to Lakhon hai nigahon mein - every time you hear these numbers you do tend to hum along even today. OP may not have been trained in classical music, but his sense of rhythm and special ability to blend and orchestrate different notes and instruments was not just incidental. It probably was truly a divine gift. People tend to associate OP only with swinging numbers but to his credit, he has also composed many a classical song - Jogiya mere ghar aaye from the film Raagini in Ustad Aamir Khan's voice (who at one point is said to have questioned OP's music credentials!) or the teasingly classical number Jaayiye aap kahan jaayenge in Mere Sanam or Dekho bijli dolefrom Phir Wohi Dil Laya Hoon to Aana hai to aa from Naya Daur. Even his seemingly simple, easy-to-sing-songs bristled with complex gamakas and sudden changes in sur and tal. Some of the instruments he used tend to play on in your mind long after the song ends, for instance the heartrending, soulful notes of the Saxophone in Yeh duniya usiki from Kashmir Ki Kali or the electric guitar inLakhon hai yahan dilwale from Kismat. In many ways, OP Nayyar did indeed make Asha Bhonsle. Some of Asha's best songs have been compositions of this man. And once they parted ways it was almost as though he had lost his muse. The music from his orchestra was never the same again. Stories abound about how this composer never worked with Lata Mangeshkar. One legend goes that Lata refused to work with him. But OP always maintained that his style did not really suit the voice of the nightingale of Indian cinema. But then OP's unconventional, cheeky attitude has always made headlines, and has been the stuff controversies are about. He truly didn't seem to give a damn. He believed that he was gifted and his purpose on earth was to make the best use of his innate talents and entertain everybody. And this he certainly did - as always, in his own inimitable style. What a lovely and soulful article! It manifests the sensitive and honest nature of the writer. Yamini ji has written this article after an indepth study and above all after immersing herself in the compositions and their emotional content. The article itself is so very lyrical and mellifluous; the words and emotions have been so beautifully strung like lovely pearls of language and wisdom. The way she has conveyed the personality and music of OP Nayyar is truly commendable.It touches one's heart. I have preserved this article in my diary.